1.Soak the toor dal in water for 30 minutes. 2.Soak the tamarind in hot water for 20 minutes. Squeeze and strain the tamarind pulp using some more water if needed. Collect the tamarind juice and discard the pulp. 3.Combine the tamarind juice, rasam powder, salt and 3 cups of water in a saucepan. Bring to a boil. Add the asafetida powder. Reduce the heat and cook uncovered for 15-20 minutes. 4.Meanwhile when the tamarind juice is cooking, drain the soaked toor dal. Process the toor dal, cumin seeds, black pepper and 1 Tbsp of coriander leaves, in a blender until smooth adding little water as required. 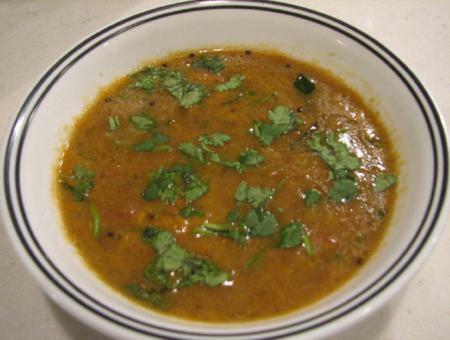 5.Add the processed paste and tomatoes to the rasam. Reduce the heat to very low. Cover with a lid and cook for 3-4 minutes or until it starts foaming (Don’t allow it to boil again). Remove from heat. 6.Heat the ghee in a small pan over moderately high heat. Add the mustard seeds, when they crackle, add the curry leaves. Sauté for a while and immediately add to the rasam. Cover the rasam with a lid and allow the spices to soak in for 2-3 minutes. Serve hot garnished with the remaining coriander leaves.